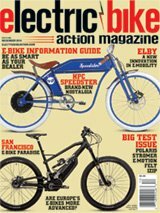 The Phantom R – an awesome, retro-styled, mid-drive electric bike by Phantom Bikes that we saw at Interbike, the international bike show in Las Vegas. Inset: Is the Gocycle G3 the future of electric bikes? Read our review starting on page 26.